Description: Mrs. Stephens taught High School classes. She helped with the Junior Play, the Junior-Senior Prom and 1950 Annual, the BOSHAN. 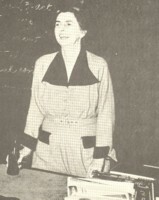 The 1950 BOSHAN was dedicated to Mrs. R. W. Stephens. She was the wife of Coach Mutt Stephens. She enjoyed telling her students that her full name was: Alicia Hayes Lasalle Stuart Stephens.